Good morning (afternoon/evening/midnightsnack) everyone! If you are coming to visit from Sew&Tell, hello! 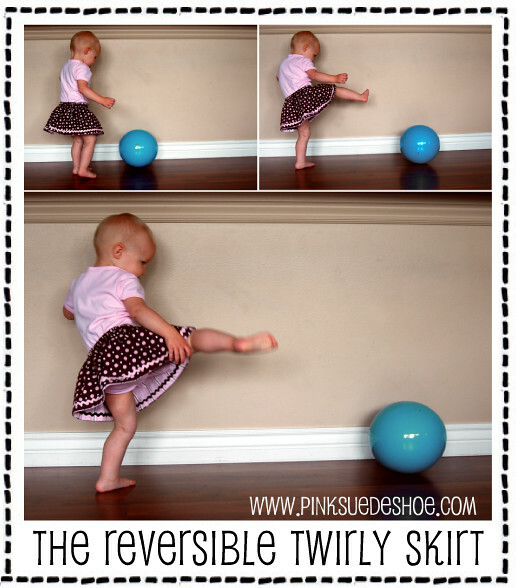 I’ve got a cute tutorial for a little reversible twirly skirt today. (You know how I love things that are reversible, aprons, jackets, and skirts.) I made up this pattern last summer and I’ve made literally dozens of them since. They are fast, easy, and super cute. And Creamie is still wearing the skirt I made for her last summer. So that means this pattern will fit about a 6 month old to an 18 month old. And it’s perfect for twirling. Or for kicking stuff. See that little reversible-ness peeking out? I love that it’s cute on the inside! So let’s get started! I’m giving loads of directions and photos, which if you are an experienced sewer you can just skip through, but this is the perfect project for a beginner. It’s like 10 straight seams. And you will impress everyone you know. It’s just that cute. First choose two fat quarters. (In hindsight, I wouldn’t pick such a dark one to go with this lighter one. When she is wearing the pink side I can still see the dark fabric behind it. 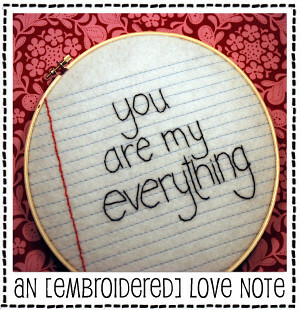 But not enough to bother me, but you might want to check that before you sew.) You can prewash or not, which ever you choose. 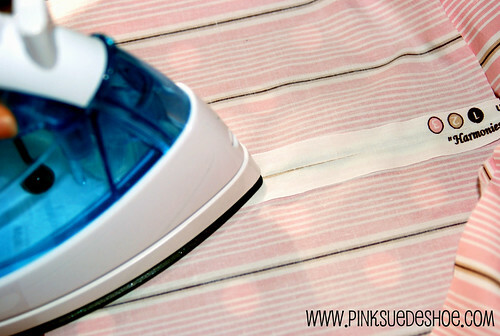 Iron the creases out and trim them so that they are both square, making sure they are the same size. Next you are going to cut your fat quarters in half the long way so you end up with two rectangles that are about 9″x22″. 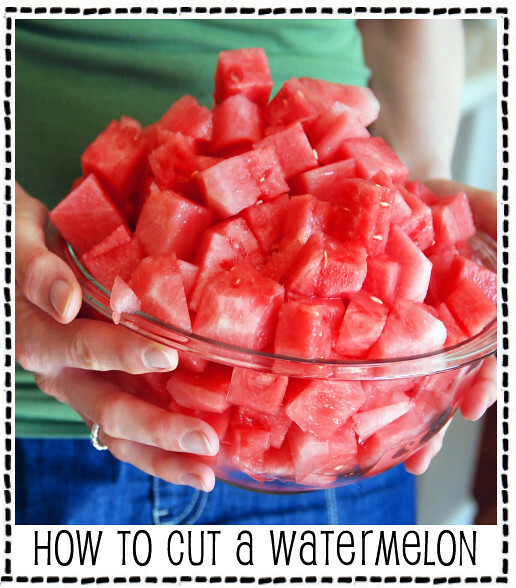 (If you are using quarter yard cuts you don’t need to do this step. 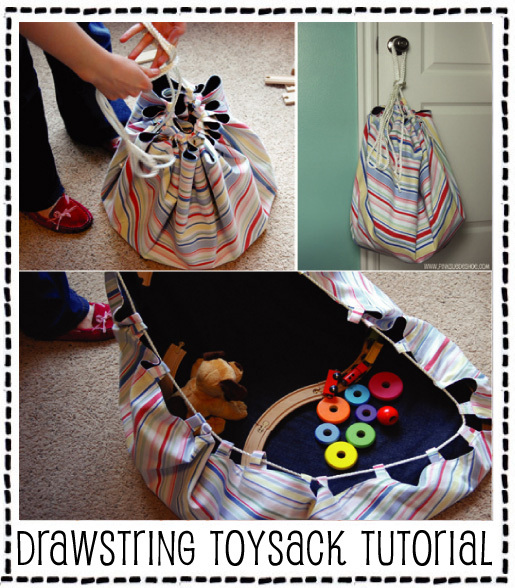 Just sew each piece into a tube.) 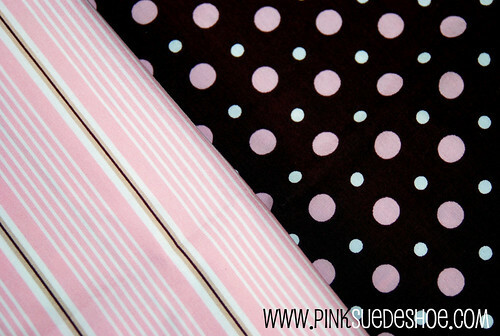 Sew them together (stripes to stripes, dots to dots) right sides together along both short sides of each set. You should end up with two tubes, one in each print. Press all four seams open, and get rid of any other wrinkles that have cropped up. Now we are going to make our hem. Along the bottom edge press your fabric up one quarter inch all the way around. 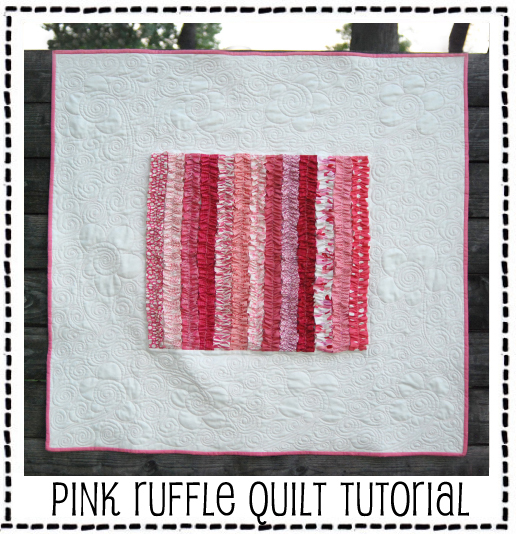 Then fold it up another 1/2″ and press again. 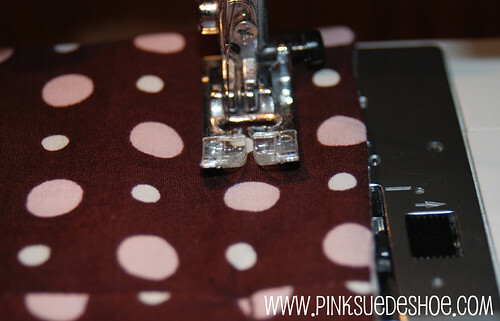 Press the hem of your second piece of fabric the same way. 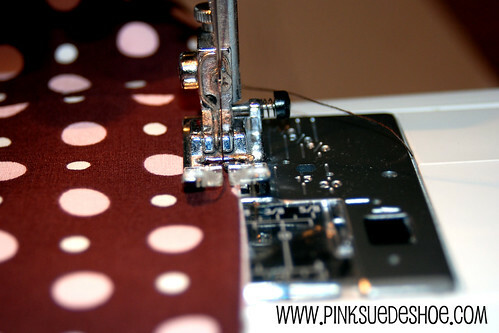 Stitch right along the edge of your folded hem, backstitching at the beginning and end, on both pieces. I used white thread on both of them because I am going to cover this seam up with ricrac later. 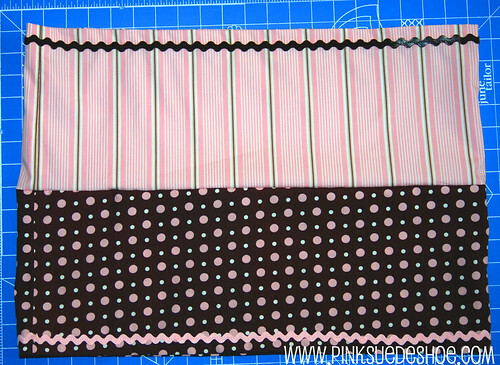 But if you aren’t going to add trim, or it’s not going to cover up this seam make sure you use coordinating thread. Add your trim to each side of your skirt. I folded over the edge of the ricrac to make a clean start. And I changed my thread to pink. 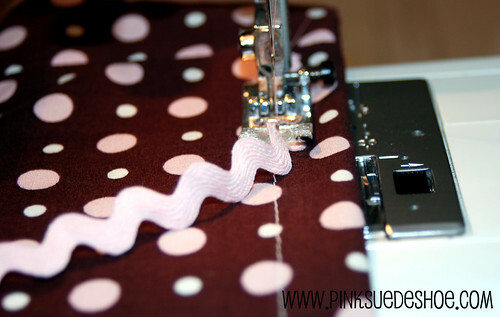 Then just sew your trim on all the way around. For the ric rac I sewed right down the center, making sure to cover up all my white stitching. Now do the same thing with your other piece of trim and the other skirt piece. And change your thread if you need to. Now you want to trim your two skirt sides to make sure they are even. 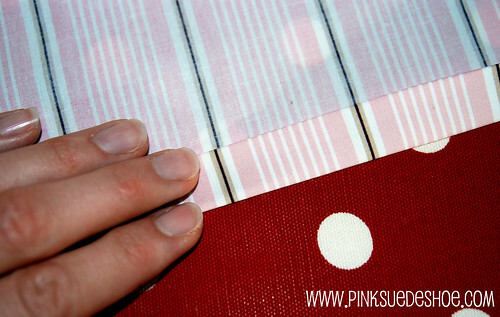 Lay them out with the hemmed sides together and trim the opposite side (which will be your waistband) so everything is nice and straight. A cutting mat and ruler make this MUCH easier. 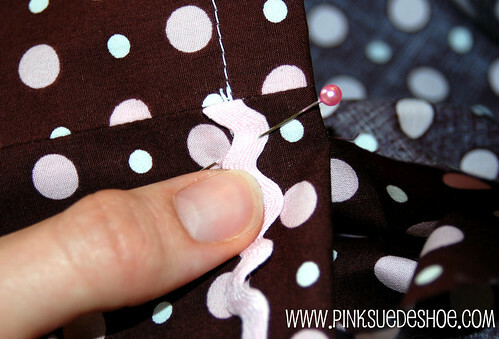 Now turn your two pieces so they are right sides together, one tucked inside the other and sew the two raw edges together to join them into one long tall tube. It should look like this. 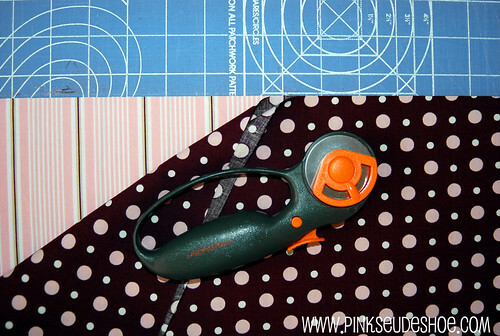 Only you should make sure that your polka dots are straight before you go cutting and sewing things together. Oops. Now it’s time to make the waistband. Fold that long tube over, wrong sides together this time, carefully rolling the seam so that it lays as flat as possible. 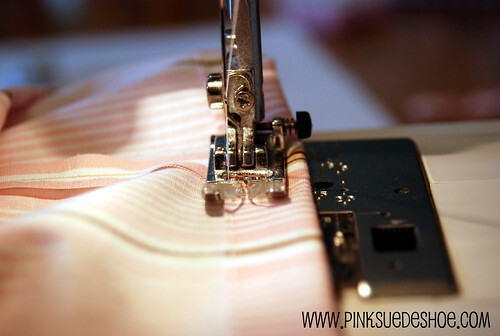 You want the seam between the two fabrics to be right on the top of the skirt, and as straight as can be. You can pin this if you need to. 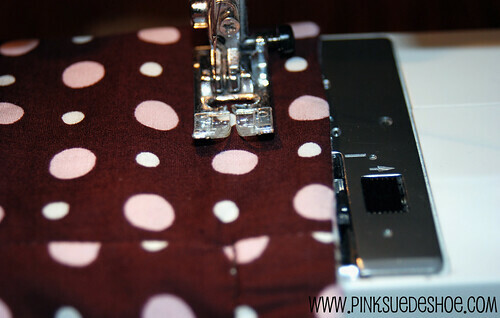 I used brown thread on the top and my white thread in the bobbin so that the thread matched each fabric. 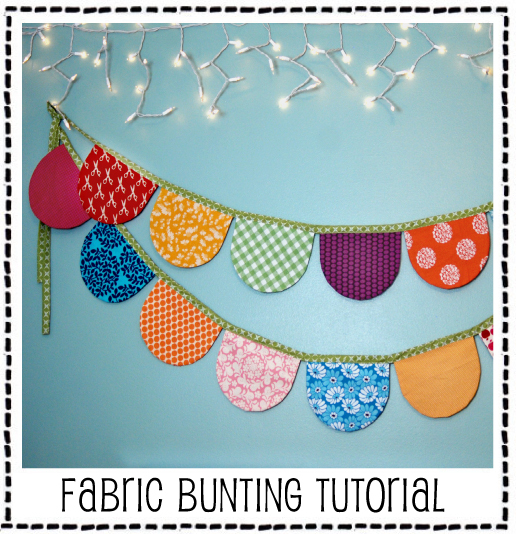 Start sewing the casing for your elastic. If you are using 1/2″ elastic, make a 5/8″ casing. 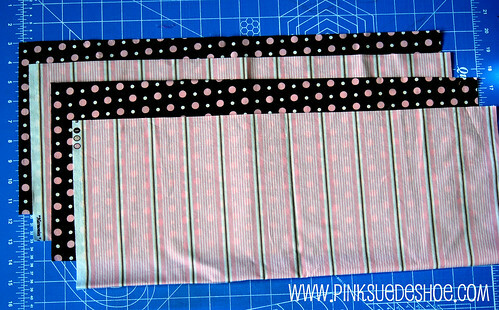 Backstitch at the beginning and end (leave a 3-4 inch opening) so you don’t tear your seam while you insert your elastic. 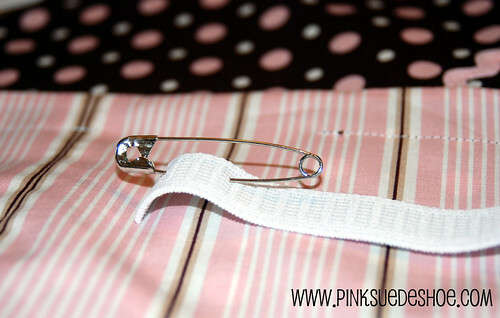 Use a safety pin to push it through the casing. I had to trim my elastic a little smaller for Creamie’s skirt. I think I ended up at about 16 inches (for the skirts I made her at age 6 months and the skirt I made her on Wednesday. She’s not getting bigger, just getting longer.) 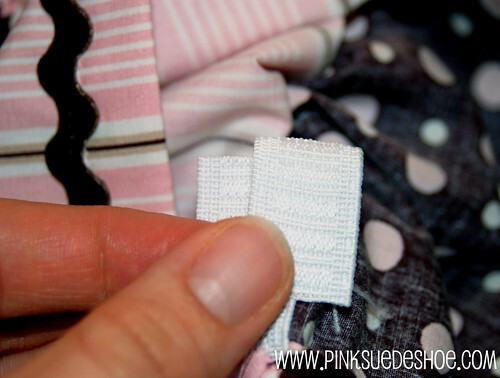 Make sure your elastic isn’t twisted and overlap your ends and stitch together. 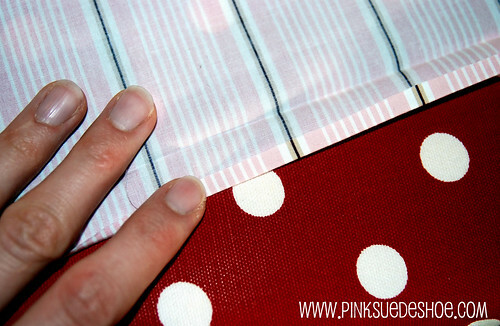 Tuck the elastic back inside the waistband. 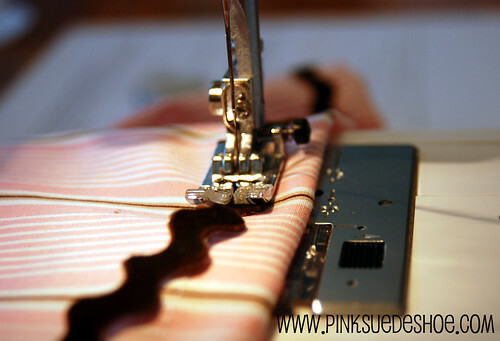 Pull your fabric smooth and stitch your opening closed. Then adjust your gathers evenly around the skirt. You are done! POST UPDATE: I don’t sew the bottom edges of the skirts together. Of course you could, but I like them as two separate pieces so they can give the skirt a little more movement. My favorite thing about this skirt is that there is absolutely NO wasted fabric. 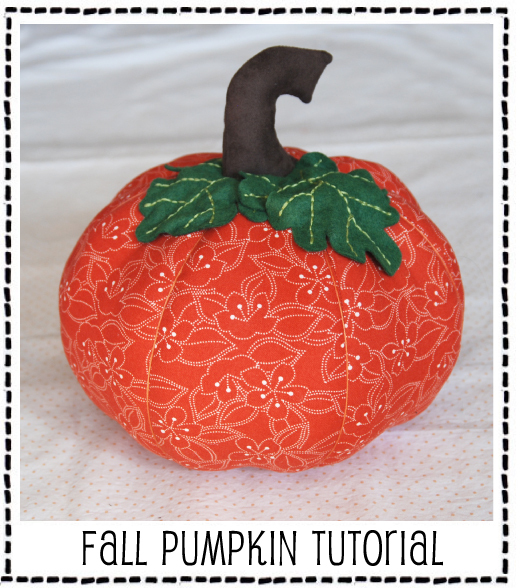 And it is so easy to customize it with different fabrics and trims. 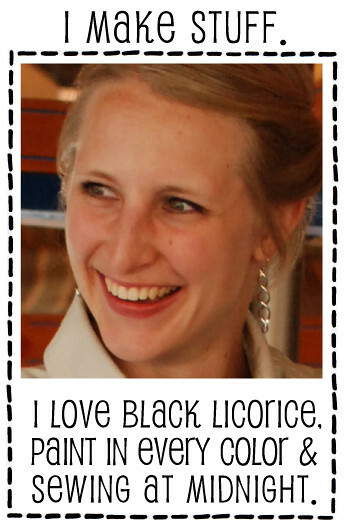 I love me some good ricrac, but you could also use lace or ribbon, a little bow or a ruffle, mini pompom trim, etc. It’s a great project to have fun with. 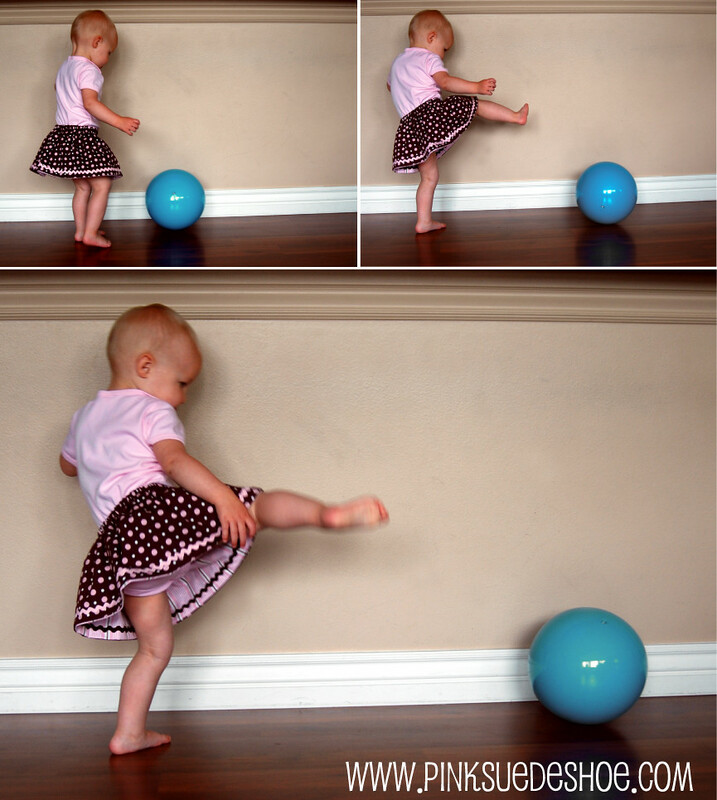 Now, send that little dancer to do some twirling. 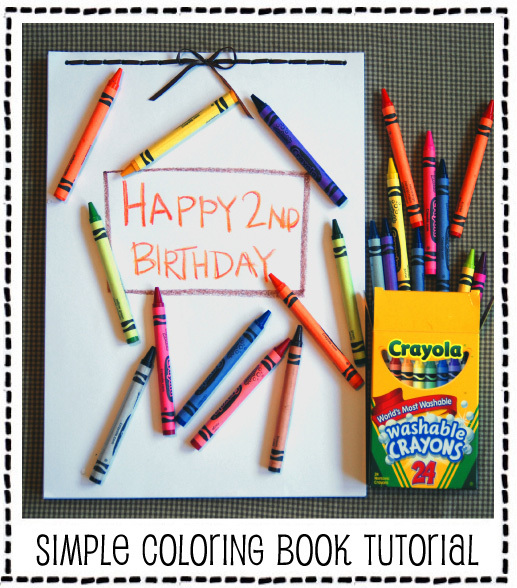 Or some coloring, it’s good for both things. Sign her up for Karate. 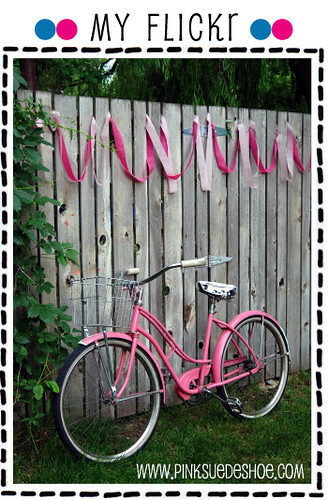 That is super cute, I think I will make one or two or maybe three! Hey I ran across a tutorial and I thought of you. 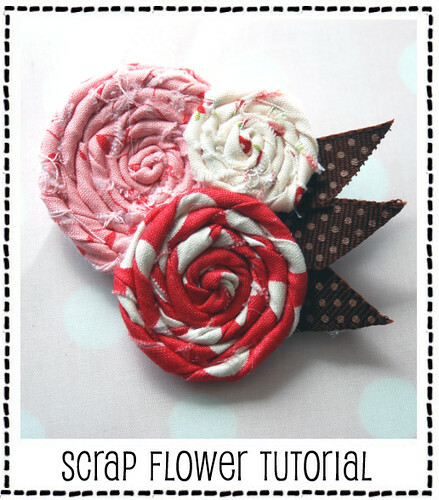 It uses scraps and is super cute! Here is the link. http://sewmamasew.com/blog2/?p=2311 okay that is all! Have a happy weekend! I made one of these little skirts today and absolutely LOVE it! Thanks for the tutorial. Oh, those cheeks. tictoc. tictoc.tictoc. that’s my biological clock going berserk. it will be under control in a moment when i remember my kids are almost teenagers and can feed, wash and clothe themselves (albeit under duress). I♥Creamie. and great tute. Do you have any alteration recommendations for 3-5 year olds? I would love to try it out, but the math for the fabric hurts my brain. Beautiful! I love pink and brown. And Creampuff is adorable in it. I love the action shots! This is toooo cute. Creamie is definitely dressing in style! That is such a cute skirt! I hope my new baby will be a girl so I have an excuse to make one for her! Hey great skirt. I just finished making mine…I think. Did you mean for the two layers to be stitched together at the bottom? I didn’t notice that in the instructions…so I left mine open. Great job! Look forward to more patterns in the future! I can’t believe you girl-you never cease to amaze me! 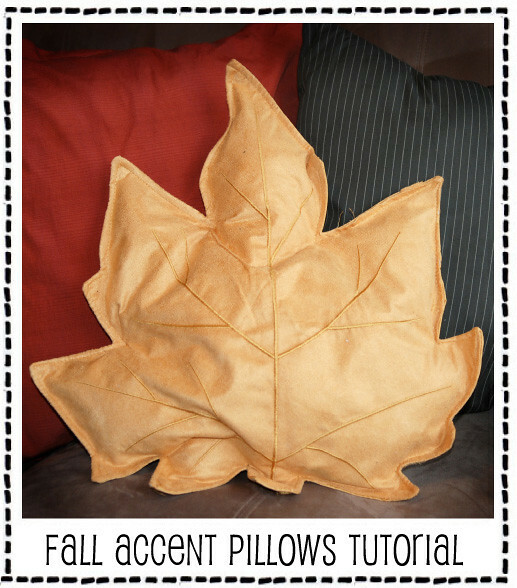 Since I don’t sew, can I pay you to make these for my girls some day-and one for me too? Great-I knew you’d say yes! ha ha ha! Cute skirt. I love a double duty skirt, especially when you are out in public and something spills! Thanks for the tutorial! It’s too cute to resist. As soon as I can figure out how to “upsize” it just a bit—for say a toddler (2—3 yrs) I will make skirts for all the little girls I know. Anyone have a suggestion? Thank you so much for this tutorial! I just made one for a friend of mine. I knew I wanted to make her two little tops to match (with an applique from each fabric), so I had to buy some extra fabric which was a bit of a pain. Think I could just cut an inch or so off the width next time? Like before I sew it into the tubes? I hope that makes sense. Thanks! Thanks for the tute, just what I needed for a last minute present. this is SO cute!!! just printed off directions! i’ll be sure to link back once i make one for my daughter!!! Love these! Can’t stop making them for my 3 year old niece. So cute! 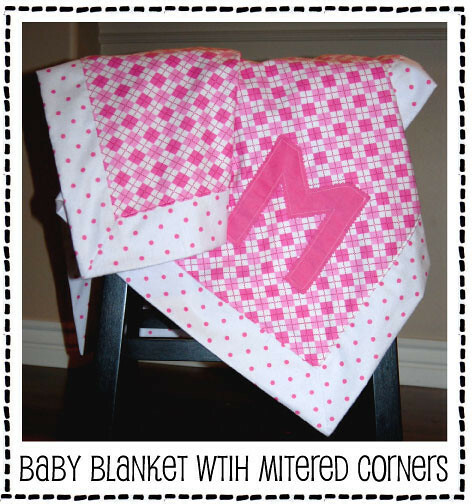 Can’t wait to make one for my granddaughter. I made a single layered version of the skirt today. 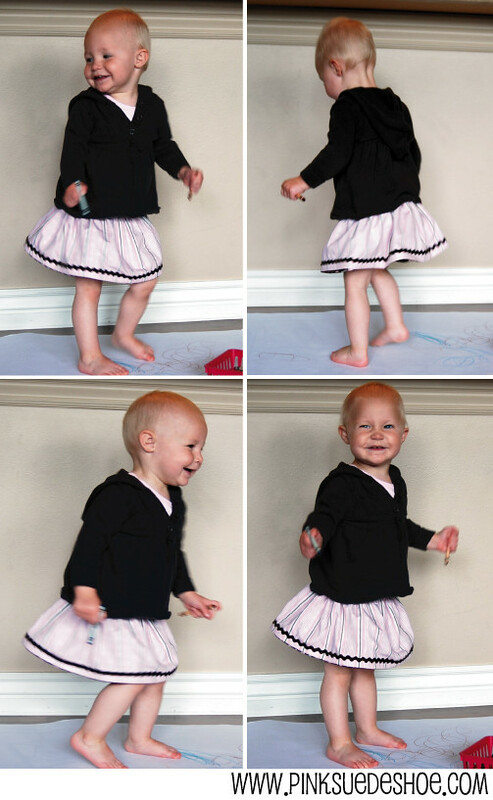 I’ve given you credit on my blog, http://rosesyarn.blogspot.com/2013/05/twirly-baby-skirt.html. Your instructions were very easy to follow. Thank you so much for this tutorial!